Rest of the Story: Can USDA Stop the Demise of Agriculture? There is a saying that a bull needs to eat every day, but a bear only once in a while. So far that has shown to be true as we continue to see ag commodities collapse to levels not seen in a long time. Cash corn, if I had any to sell, in northern Illinois is now near $3 before I spend 12 cents to get it delivered. Corn price in Northern Plains likely has a “2” in front of it, while where basis is (-10), it is better but land rents likely cobble up another 50 cents a bushel ($100/ac or more higher). Crop condition continue to improve in a backdrop that some agronomists suggest the corn is growing too fast and it will run out of gas if things don’t change, and the fill time will be significantly cut unlike what happened last couple years. Elwynn Taylor stated in the media yesterday echoing another respected analyst from Colorado that El Nino is making a comeback as soon as 30 days and that in fact weather trends are changing now that gives further confidence that yields will exceed trend in a manner similar to last year—as things stand now. It appears that the market is now trying to discount yields of 178—180 bu/ac in corn along with the extra million acres over that estimated last March. Soybeans are still plagued with the China syndrome with more and more analysts doing their research and finding that indeed China could cut imports by 15 mmt even this year and for the 2018/19 marketing year. If so, it is no wonder soybeans are seeking a level that even a 25% tariff is acceptable. Sometimes it is not as much as what we know but what we don’t know that makes markets. In our case, in 2018 it is what we don’t know that we don’t know that is key—particularly tariffs, what China will do or not do and what will USDA do to support prices that won’t disrupt the last 20 years of trying to obtain free markets. So, a lot is at stake, especially now that farmers decided to grow too much of everything in an economic environment that is not so much about how low we will see prices but ultimately what will happen to machinery and land prices as we deal with a potential surplus problem that “could” extend for some time. I’ve alluded to a paradigm shift in ag in previous columns. China is in the process of incentivizing our competitors, which is one of the things I feared months ago. Until I hear/or see something to the contrary from the Secretary of Agriculture or other administration economists I have can have no other conclusion, other thank either apparently our U.S. government hasn’t a clue of their plans as they didn’t expect about as well as most recognizable advisors and many wannabee analysts! Markets continue to get negative news if it isn’t from the tariff situation where more and more in the trading circles are finally coming around to being suspect that it will be a short-term situation or that the administration has anything concrete planned as Secretary Purdue says he will wait until September to implement any new strategies—likely by then they may have one in place. There is certainly “deer in the headlights” syndrome amongst their economic advisories. Unless the report on Thursday has a major bullish factor, there won’t be a change in attitude. There may be surprises in the global outlook for grains as USDA will separate China stocks from Global stocks. We have looked at that scenario for years but odds are if most advisories are as naïve as I suspect, they may find a friendly needle in that hay stack. I have mentioned in previous columns in the media that after the price-ship has sailed, news comes out as to why prices collapsed or exploded and after big money is likely positioned accordingly. Not a conspiracy thing, just fact. Now comes another! In a study commissioned by the U.S. Soybean Export Council, Purdue University economists paint a gloomy outlook on what tariffs will do to US soybean prices of a magnitude that will have bankers marching in Washington DC See https://www.purdue.edu/newsroom/releases/2018/Q1/study-u.s.-soybean-production,-exports-would-fall-if-china-imposes-tariffs.html for complete report. If there is any solace in all this it is that such negative news is coming after the collapse in soybeans of $2/bu not months ago when you read in this column of the potential impact on prices due to tariffs and fake news of China needing our soybeans. That opinion didn’t even get honorable mention in the back page of the local news as it wasn’t what folks wanted to hear. My disappointment was that even though I was 100% hedged in cash and futures sales at times, I wasn’t negative enough—I should have recommended 150% or even 200% or more covering the next few years at $10 and higher. I doubt however such recommendation would have been heeded anyway as it was impossible to conceive that China doesn’t need us! Looking at the technical aspect of the market (price charts) along with having done our due diligence months ago by passing off risk through hedging and cash sales of both 2017 old crop and new crop, there are reasons to be optimistic only because of prices “relatively cheap” compared to just two months ago. However, there is grave concern that prices collapsed for more than the threat of tariffs or that weather would mean a 52 bu crop not a 48 or 46 bu yield. If the study done by Purdue University economists is anywhere near close, Katie bar the door; prices are not cheap relative to their longer-term outlook. CORN: I watch a lot of things amongst them are the spec position, which is getting more negative as well as short term moving averages, weather and general psychology of the market. Fundamentally carryover will likely be near 2 bil-bu or perceived to be for a long time. Chart wise, it is telling us that either there is a plan to provide support, or is carving out a trading range that could last for some time—months!!! Prices below $3 can’t be ruled out. Important price points are the recent low at $3.58 ½--that is equivalent to $3.47 close in September futures which would mean for me a $2.98 cash price on-farm in N IL. The worst I’ve seen in a decade or more—last time was just before prices rallied significantly----but that was then and this is now and now is way different eco-politically then back then. The risk is that the crop report on Thursday is negative enough that we close below $3.47 Sept or $3.58 December on Friday. Short term put options are cheap insurance to get through the report but spending money to provide coverage is tantamount to acknowledging our government doesn’t yet have a plan and that farmers will vote in November as they did in the last election and that we are like sheep being led in good faith but off a cliff. There may be a few who actually believe the scenario presented by Purdue University? Prices shown in chart below are as of noon July 10th. SOYBEANS: have been and continue to be a problem dating back to 2017 and the magnitude has increased beyond what even we believed to a point where, if you look at various advisories (likely the majority) there was woefully small coverage of 2018 along with 2017 coverage to the point where there is nothing for them to do but state that they will be sellers of any significant rally—believing there will be a weather problem. The prospect of El Nino coming back into force in next 30 days to make all things better for grains---the key is will it or won’t it---if the accuracy of maps and the analysis of same isn’t any accurate than predictions of moisture, one has to be suspect—if El Nino is delayed 2-4 weeks that spells warm to hot/dry in August--- so some upside risk in soybeans that may not be there in corn. There continues to be analysts still drinking the same Kool-Aid regarding China HAVING to buy from the US---- unfortunately a lot of producers drank with them. So now it matters not who is right. The problem is the ship sailed and they need to drink the same potion in hopes that eventually the US will make nice and China will return. Let’s hope so. The story book has been hinted by Purdue, and the ending isn’t good! WHEAT: After lifting July hedges on 70% of production due to July going into delivery on July 1, I have yet to re-instate hedges in December risking perhaps good news from USDA on Thursday that might show a significant reduction in European, Russian and Ukrainian wheat production (globally) and the reality of what separating Chinese stocks from global stocks implies. By the looks of Tuesday’s trade, I may be the only one with any optimism from these price levels. Or, the market is understanding the “Purdue” outcome and realizing that wheat at these prices competes pretty well with $7 soybeans--- Gag! December Chicago wheat chart below! There was a chart floating around a couple weeks ago in the media trying to show just how cheap corn, soybeans and wheat are comapratively speaking, expousing the good-buying opportunity. Well it looks like the potential is good-bye car, good-bye house, good-bye farm as we are now below levels that should have held support with a technical indicator I use indicating a new short position based on a monthly basis as of June 30. While I respect what it is indicating and taking it along with long term implications of tariffs (Purdue study as well as my focus months ago) the month of July obviously important and flexibility is important. It points to a situation I am not thrilled with admitting to myself. Does it mean a new paradigm in Ag and how we will trade (or not). I’d sure hate to think that passing up a chance to sell land last year was a big mistake---I spent 20 years watching a sideway trading market that started in 1985 and lasted until the ethanol mandate around 2005. Have we now created a nemisis that my offspring will have to contend with for another 20 yrs? I hope not but have not doubt we’ll be able to manage the associated risk---been there and done that successfully before. Having said all of the above--- if you are finding yourself disenchanted with your situation in 2018, it is not too late to change attitude. After all, in the final analysis the buck stops with you. However, one needs all the good advice and information from which to make a sound decision that he can get. Cheap newsletter advice is just that. Anyone can look good in a bull market. Being in a good position when adversity hits is priceless. As we can see from the last 45 days especially, that really began months ago, good information is priceless in these difficult times. Did the Grain Markets Sell the Rumor, Buy the Fact? Wow, what an interesting week in the grain and oilseed markets. After a rapid month-long collapse, corn and soybean prices posted significant reversals. 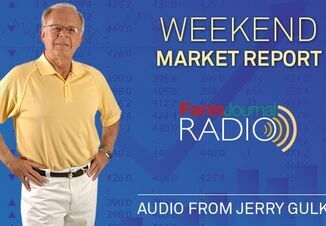 This week in Rest of the Story Jerry Gulke discusses the evolution of the negative connotation from “irrational exuberance” in soybeans and how the psychology of the tariffs is affecting the markets.